A North Korean flag flutters on top of a tower at the propaganda village of Gijungdong in North Korea, in this picture taken near the truce village of Panmunjom, South Korea, August 26, 2017. SEOUL - In response to Pyongyang’s nuclear test on Sept. 3, its most powerful to date, some countries have announced they have expelled the North Korean ambassador accredited to their capitals. 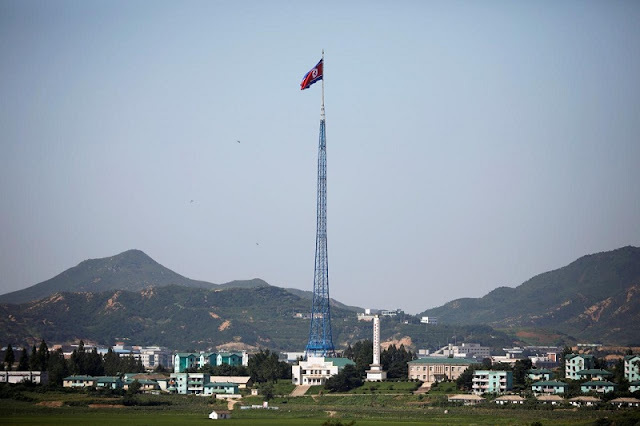 Despite North Korea’s increasing isolation as it continues to violate international sanctions, the impoverished state still has 49 overseas missions, and diplomatic relations with 160 countries, according to South Korea’s Unification Ministry. Beyond its largest missions in Moscow and Beijing, North Korea also has major embassies in London, Rome, Stockholm, and Berlin, as well as dozens of smaller embassies across Africa and Asia. - The Spanish foreign ministry asked North Korean ambassador Kim Hyok Chol to leave the country by September 30 citing his country’s repeated refusals to renounce its nuclear weapons program. - Kuwait said it has ordered North Korean ambassador So Chang Sik and four other diplomats to leave within a month as the country downgraded diplomatic relations with Pyongyang. North Korea’s Embassy in Kuwait City has served as the only diplomatic station in the Gulf region for North Korea. - Peru’s government announced it was giving North Korean ambassador Kim Hak Chol five days to leave the country in retaliation over North Korea’s sixth nuclear test. - Mexico declared North Korean ambassador Kim Hyong Gil was “persona non grata” and was to leave the country within 72 hours in protest at the North’s sixth nuclear test, citing that it was a “flagrant violation” of international law and U.N. Security Council resolutions. The only country to have completely ended diplomatic relations with Pyongyang in recent years was Botswana, which severed ties after a United Nations investigation revealed extensive and widespread human rights abuses in North Korea. - Cairo said it was cutting military ties with North Korea. Pak Chun Il, North Korea’s sitting ambassador to the country, was blacklisted by the United Nations on November 30, 2016 in response to Pyongyang’s fifth nuclear test that September. - Manila’s foreign ministry said it had suspended trade relations with North Korea to comply with U.N. Security Council resolutions over the North’s repeated missile tests. - Kampala said it has halted all military and security ties with Pyongyang in May last year following extended cooperation with North Korea in police training and regular military training for the Ugandan armed forces. In response to Pyongyang’s nuclear test on Sept. 3, its most powerful to date, some countries have announced they have expelled the North Korean ambassador accredited to their capitals.